It's that time of year again when we start seeing the beautiful rich colors of the season! It is my pleasure to pair up with Melissa from Rose Marie Shadows to help present the new 2013 Limited Edition Fall Collection! I've been a fan of this indie brand for years. The colors are beautiful, intensely pigmented, affordable, and cruelty free! So I was extremely excited when I was offered a "sneak peek" into the fall colors! This collection will launch Monday, October 15th and will only be on sale for a limited time! The colors are knock-outs! Simply gorgeous if worn alone, or if paired up together. I hope you like the look I created. Happy FALL! Here are the colors close up. I found this gloss a while back, it's the perfect Fall plum! I love the colors, they are extremely beautiful and perfect for Fall! 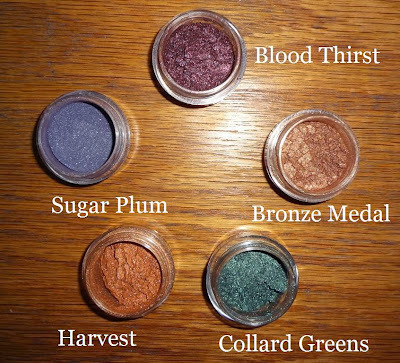 I think that Harvest and Blood Thirst are two of the prettiest colors I've seen so far with Fall makeup. Can't wait to show them off! Thank you so much for stopping by :-) I truly love it when you do! Sugar Plum looks my kind of shade! You look lovely as always. Oh wow, this are amazing! Love the look you created with them :) Hope your mother gets well soon.